If a lawn is healthy and lush it will crowd out weeds and make it extremely difficult for new weeds to establish themselves. So if your lawn has a problem with weeds, your lawn isn’t healthy. Applying a herbicide to your weeds isn’t going to solve your weed problem, they will just keep coming back until we get your lawn healthy. Weed Pro believes in the safe use and practice of herbicides that have a proven safety record. All weed control products used by Weed Pro have been tested and are registered by Health Canada’s Pest Management Regulatory Agency. All our weed control technicians have been trained and licensed by the proper Provincial authorities. Weed Pro’s equipment is calibrated to apply the correct amount of product to eliminate weeds. Our weed control is a contact only product. This means that when we apply our weed control it needs to land on the surface of the weed leaf. Weed Control works best when weeds are young and actively growing. By the time July comes around, weeds defend themselves from the hot dry weather by encasing their leaves with a thin waxy film. This waxy film reduces the effectiveness of the weed control by not allowing it to be absorbed into the plant. The weed control we use does not have a residual quality. That means the weed killing property is only good at the time it is applied. If a weed seed is just about ready to germinate when we apply our weed control, our weed control will not prevent it from sprouting the day after the application. This non residual quality is a good thing both for health and safety reasons, and also for the environment. It also means that we can over-seed a lawn a couple of days after applying weed control. Some things to keep in mind after we have applied weed control. Please stay off the lawn until it has dried. With in a few hours of applying our weed control the product has become about 80% rain-fast. Meaning that you will see about 80% effectiveness if it rains 2-3 hours after the weed control was applied. The label advises to not water for 24 hours to have the full effect of the weed control. We recommend holding off at least until the following morning. 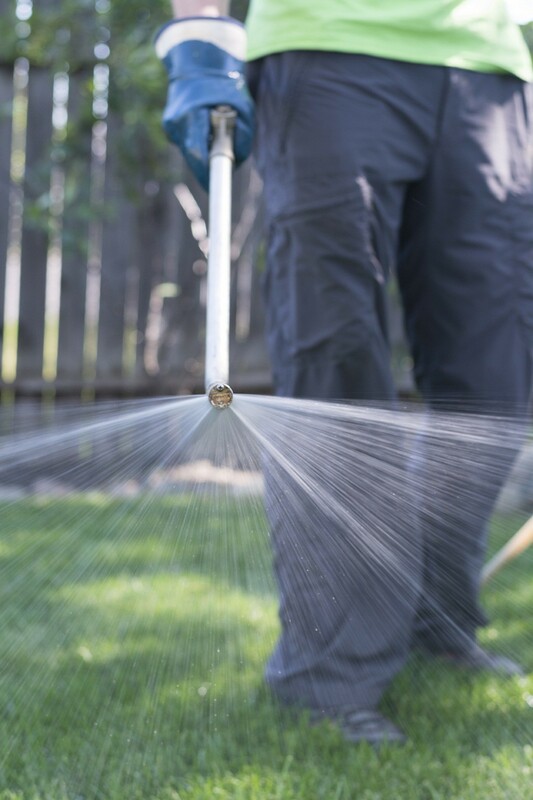 Applying weed control just after a light rain or when the grass is moist is the most ideal time, as the leaves of the weed are already actively absorbing water into itself. Try to refrain from mowing the lawn for a couple of days after. Otherwise the blade of the weed leaf may be cut before the product gets absorbed into the whole plant. The weed is dead and has no hope of recovery with in 48 hours. However, the effects of the weed control will take time to see. You can expect the weed to start looking sick and limp within 4-7 days. The weed then must shrivel up and dry out for it to disappear all together. This usually takes 2-3 weeks depending on how hot it is.